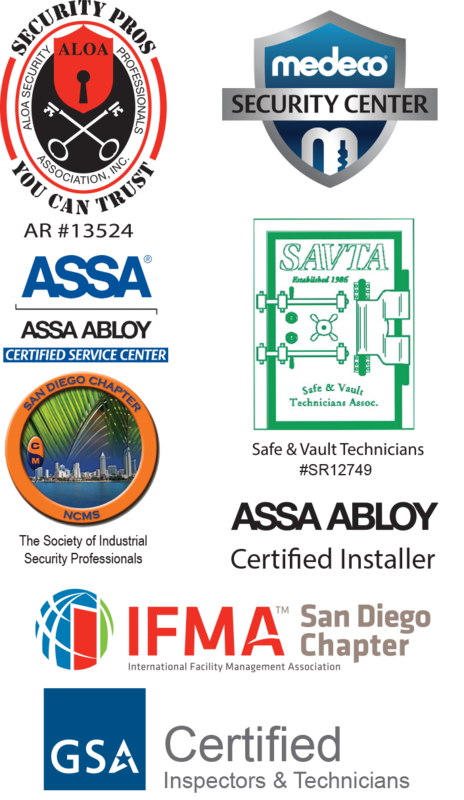 Accurate Security Pros provides Locksmith services in San Diego as part of our layered approach to security. The base layer to this structure is “Lock it” or the Locksmith services we can provide. We know that when you start from professionally installed and maintained quality lock hardware you end up with a much stronger foundation to build your facility’s security on. Our technicians are trained in all types of locksmithing including door hardware, exit devices, mortise locks, door closers, doors, frames, high security lock cylinders, key controlled products, glass store front door repair, master keying, lock repair, security consulting, and crime prevention products, to name a few. We offer a full array of keying services including simple home or office re-keys to complex and intricate master key systems to allow your facility to stay organized and secure. Accurate Security Pros takes pride in being able to offer our customers the best Locksmith services along with expanded security offering to create your facilities total security plan. We offer mobile Locksmith services in San Diego and the surrounding areas. For more information please contact us at (858) 271-1155.